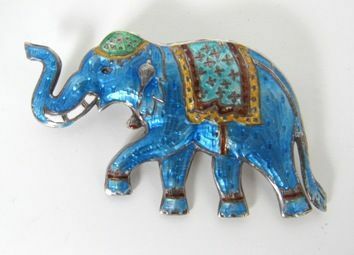 Sterling silver elephant pin with an ice blue gullioche enameled body. 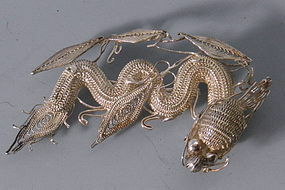 This is an earlier piece of Siamese jewelry made pre 1935 and the detail is exquisite. Photos do not do it justice. Measures about 2.5" long and 1 3/8" high. You will not be disappointed. A fabulous Whiting and Davis 18K gold plated 3 coiled snake mesh bracelet with original box. 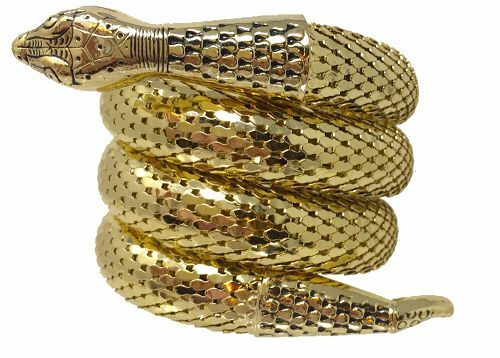 Known as the Cleopatra Serpent bracelet, this bracelet was designed in conjunction with the Hollywood studio promotion and premiere of the movie "Cleopatra" in 1963. Signed Whiting and Davis on back of the snake's head. In pristine condition, the snake body 2 1/2 inches high (one coil measures 5/8"). 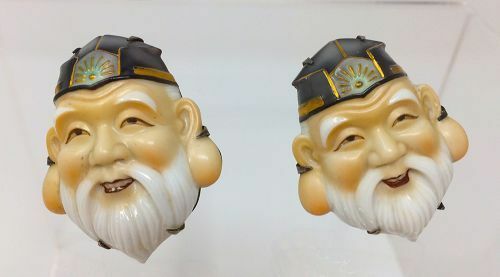 Fabulous Toshikane God of Longevity Porcelain Cufflinks. Signed Japan Silver with Toshikane Hallmark. Rare and measure about 2 3/4” tall and 1 1/2” at widest point. Vintage Oriental style bracelet with off white painted metal and cream colored Chinese figures(notice I didn't say the "I" word to even describe the color in fear of being raided or blocked online). The figures are a composite material or plastic. The bracelet is 7.5" long and 1.5" high. Earrings are about .75" square. All in excellent condition. Large and weighty Navajo sterling silver ring by Native American designer Robert Becenti (1949-2001). 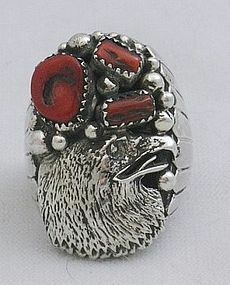 Ring features an eagle's head and red coral. Signed "RB STERLING" and in excellent condition, the ring measures 1.75" high. 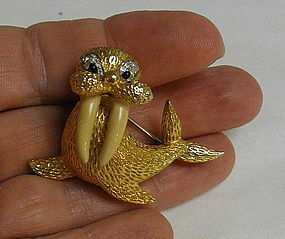 A fun goldtone walrus pin with ivory colored enamel tusks and sparkling black eyes accented with pave set clear rhinestones. Designed by Jomaz and in excellent condition, it measures 1.25" high by 1.75" across. 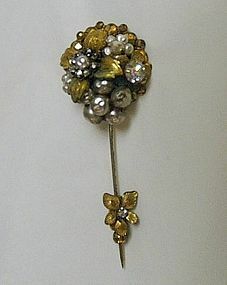 Signed vintage Miriam Haskell stick pin with rhinestones and pearls. Measures 3" long. 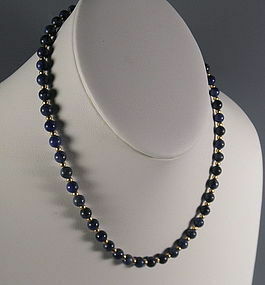 String of round natural lapis lazuli beads inter-spaced with yellow gold beads. 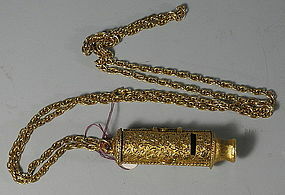 The lapis beads measure 6 mm each and the necklace measure 16" and has a gold screw barrel clasp. 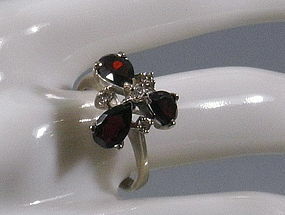 A lovely Mid Century featuring three pear or drop cut garnets prong-set in a 14K white gold mounting. The sparkling center is comprised of a small diamond with a diamond between each garnet. 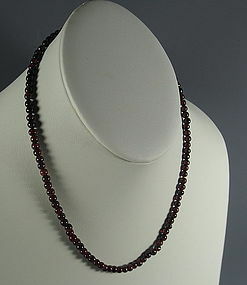 The garnets are quite lovely and the color is excellent. Please contact us for more information. 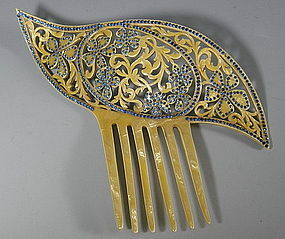 A beautiful ornate hair comb with sparkling blue rhinestones. Made of ivorine, the back of the comb simulates ivory while the front of the hair comb has a layer of pearlized celluloid. The top is cut through with fancy leaf and scroll work with rhinestone studded flowers. Measures 7" wide across the top by 6" high. 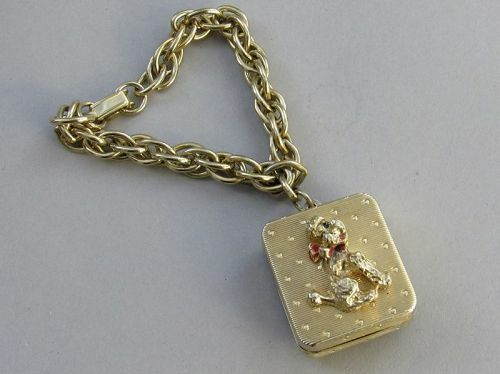 Circa 1960s Max Factor compact in shape of a pocket watch can be easily worn as a necklace. The front features faux tortoise shell. 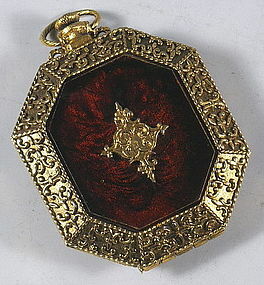 Original label on back describes this as "Golden Signet Compact". In excellent condition, it appears never to have been used. Measures 2.75" x 2". Small sterling silver knife pin with Washington, DC and 1949 hand engraved on front. Marked Sterling and SB on the back. Silver pins like this were often given to young ladies in the 1940s when they selected their sterling silver flatware pattern. We don't know why it is engraved unless some were used as souvenir pieces. An interesting and pretty conversation piece, it measures 2.5" long. Lively green peridot cluster grape pendant and matching earrings. 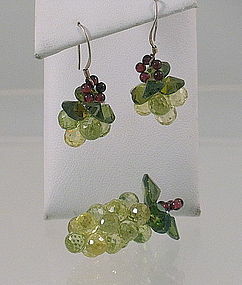 The grapes are made of sparkly light green multi-faceted beads, leaves are a darker green peridot, and the bails are made up of round ruby beads. The true beauty of this set is that you cannot see any wires used to assemble the grapes and leaves. Earring drop is 1", 14 kt yellow gold wires. Pendant is 1.25" long. 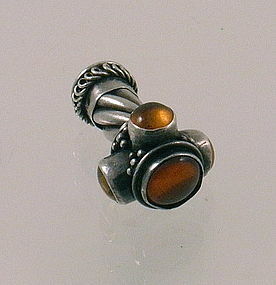 An unusual solid sterling silver pendant with 4 bezel set amber cabochons. In excellent condition and possibly Mexican, it measures 1" long. Could also be used as a charm for a bracelet. Please email for more information.